Pipeline Quashed!! Victory Parade and Party! 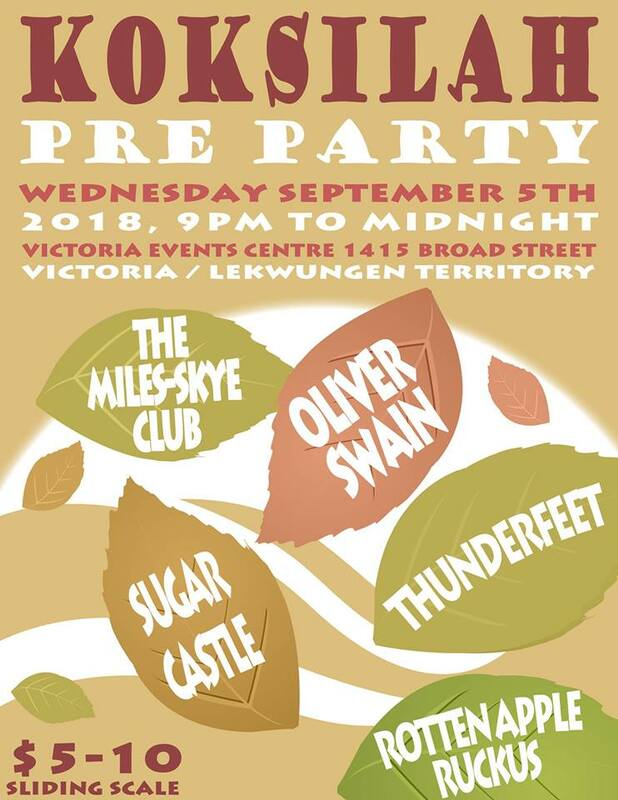 Get your happy asses out in the streets in vic this evening people. 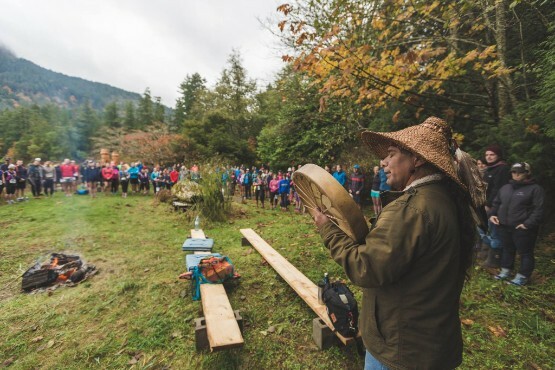 The indigenous-led resistance to Kinder Morgan has won a sweet and undeniable victory in court today! This morning the federal Court of Appeal dealt perhaps the final blow to Trudeau's ill-conceived tar sands expansion plans, ruling what Indigenous communities in the forefront of this battle and the massive groundswelll of public oppposition to this project have been saying all along--that the NEB approval process was bogus and that Canada did not propelry or respectfully consult First Nations who remain steadfast in their refusal to the allow this project through their territories. The government has been sent back to the consultation process with First Nations and we know that consent won't happen and like we knew all along: This pipeline will never be built! 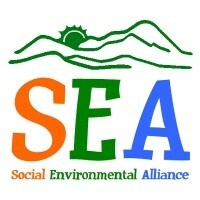 This is a major vindication and victory for Indigenous Title and rights, for climate justice, for our coast, for the southern resident orcas and for people power over the narrow vested interests of big oil, at a time in which we desperately need to be collectively transitioning to a post-carbon economy rooted in respect for Indigenous sovereignty and rights. Under the strong and principled leadership of Indigenous nations, we did this together and together we must celebrate.!!! Tonight in Vic! 5 pm, meet at Centennial Square and dance in the streets for a battle fought long and hard by al of us together! 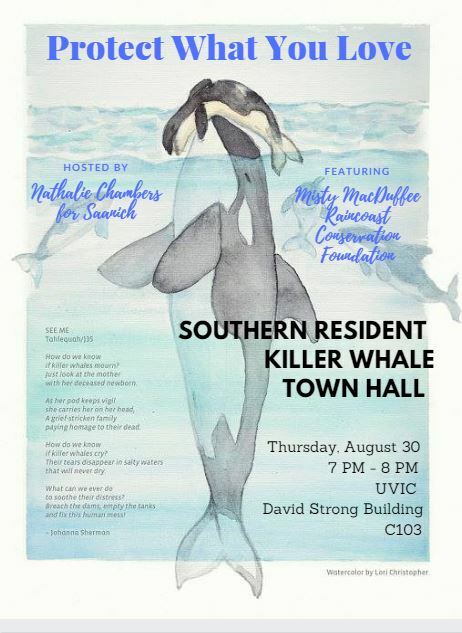 We will be hosting a Town Hall gathering focused on the state of our endangered Southern Resident Killer Whales (SRKW) and the risks they face here in the Salish Sea. Misty MacDuffee, renowned Biologist and Program Director for the Wild Salmon Program at from Raincoast Conservation Foundation, will speak about the SRKW's for 45 minutes with time following for questions. She will discuss the vital relationship between the Orcas and the wild Chinook Salmon, pipeline concerns, scenarios for spill impact and response, and more. Nathalie Chambers, a former major gift fundraiser for Raincoast Conservation Foundation has found much hope in the Population Viability Analysis that indicates: if Chinook populations are increased by 30%, vessel disturbance are decreased, and the pipeline is stopped, then, scientifically we can save the SRKW population. Following the Town Hall, at 9PM, all are welcome to a Ceremony at Cadboro Bay Beach to honour our Orca relatives and grieve for the loss they have endured. This Saturday we're working on two art projects for Rise for Climate: a banner to lead the march, and putting together a giant piece of fabric for painting a collaborative banner on the 8th. Come join us for painting, sewing*, or both! The art build will take place at CityStudio Victoria which just moved to a new location at 711 Douglas St, in the old Crystal Gardens. * In particular we're looking for people with sewing skills, and people who can bring your own sewing machines so we can make the banner faster! Rise for Climate Poster - Here's a poster/graphic for sharing on social media! 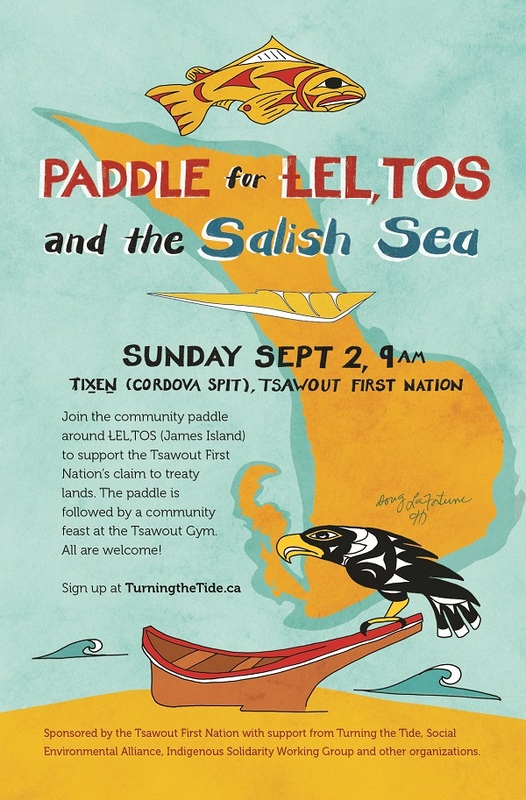 Everything is coming together for an inspiring, important event, which Turning the Tide is organizing in partnership with Tsawout First Nation and other organizations, happening on Sunday September 2 beginning at 9:00 am at TIXEN (Cordova Spit) (view map here). Some paddlers are camping prior to the community paddle at the CRD Island View Beach Campground, on the Friday, Saturday and Sunday nights (August 31-Sept 3). A block of campsites has been reserved for these nights, and you are welcome and encouraged to join for all or some of these nights. Please let us know if you would like to camp, so we will have an idea of numbers. We are asking for $20 per person to cover camping costs. Meals will be on a self-catered basis, with encouragement of potluck dinners for those who are inclined. Please take a few minutes to read the Paddle for ȽEL¸TOS Safety Policy and Participant Consent Agreement, which every participant will be required to sign before leaving TIXEN the morning of the Paddle. We've posted a new promotional film about the significance of ȽEL¸TOS to the WSANEC People at www.turningthetide.ca. Thank you -- and see you at the Paddle (and, hopefully, for camping too)! Let's gather at noon on September 8th, in unison with an international day of climate action and jam the streets from Uptown to downtown to tell decision makers its time for Canada to slam the brakes on fossil fuel expansion! On this day in cities, towns and communities around the world, people are organizing thousands of rallies to demand a liveable climate future and an immediate end to new fossil fuel mega-projects--because its 2018 and our collective future cannot wait! In Victoria, we are resisting Prime Minister Trudeau's criminal scheme to spend $15 billion to triple the capacity of the Trans Mountain tar sands pipeline, threatening the Salish sea, Indigenous lands, lives and waters and further destabilizing the world's atmosphere, to the peril of peoples and ecosystems world-wide. No more stalling, no more delays: the smoke in the air is a sign that it's time to invest in a fast and fair transition to 100% renewable energy. We won't let Trudeau turn this country into a nation controlled by climate criminals. We are all in this together. Together, we will lead from the grassroots up! Bring your your drums, pots and pans, banners and spirit of peaceful resistance for all life on earth! Bring your bikes, skateboards, bring your kids and friends, and lets show the people's will for a world beyond dangerous fossil fuel dependency and the petrostate. The mobilization will end up downtown where there will be a collaborative painting of a public mural. Arrangements are being made to provide carbon-free transportation for elders and those who may need a ride. Come join the GVCC on a bicycle tour exploring events in Victoria's social justice history. With interpretation provided by local historian Ben Isitt, we will discover people, places and stories which were instrumental in the social justice movement in this community and beyond. This tour aims to serve as a reminder that while many Canadians enjoy freedom, equality, prosperity and diversity today, this has not always been the case for certain people, and that the goal towards a just, progressive and inclusive society still continues. This is particularly true in these current times when progressive ideals are being openly challenged. The tour starts at Fernwood Square (near the Belfry Theatre) at 10:00 AM and is approximately 15 km in length. As this is a GVCC sponsored ride, a properly working bicycle and a helmet are required. Water and snacks/lunch are also recommended. We look forward to seeing you on September 9th! 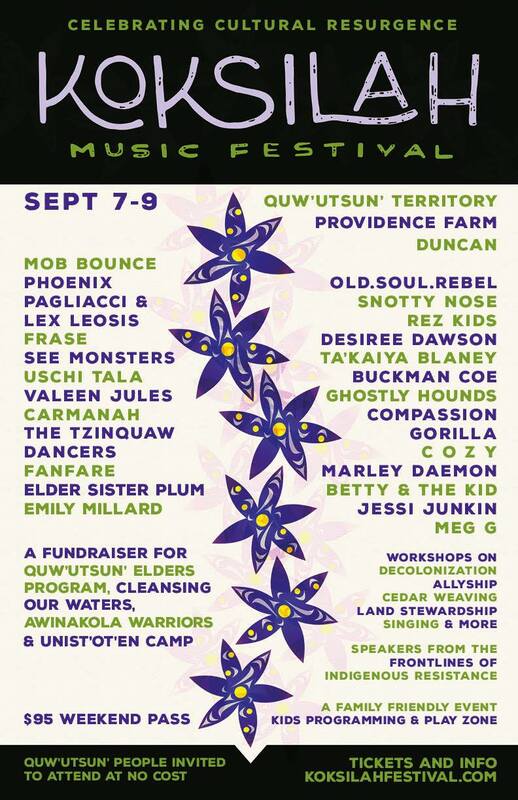 Our One Wave Gathering celebration will take place at Centennial Square on September 15th. This free public event will feature a day of Pacific music, art, and dance, as well as opportunities to explore social and environmental causes pertinent to the region. Check out our Events section for more details on the different happenings during this years One Wave Gathering, and stay tuned to the page for updates on event presenters and artists who will be in attendance! As part of One Wave, a digital media installation entitled the Longhouse Legacy Exhibition will open on September 1st at MediaNet's new Flux gallery, and lead up to the signature One Wave Gathering celebration on the 15th. A youth produced impressionist digital collage will be projected in the shape of a cedar house front, paying tribute to The Longhouse Project and the communities it represented at last years anniversary event. The opening will also welcome representatives of Vaka Taumako, to present their debut Polynesian wayfinding documentary We, the Voyagers. Throughout September, the gallery will run a variety of North and South Pacific documentary screenings, interviews, and Indigenous artist, youth, and scholar presentations. and a public discussion on how citizens can mobilize and organize to advance social and ecological justice at the local government level. and operational policies on housing, transportation, parks, culture and other issues? 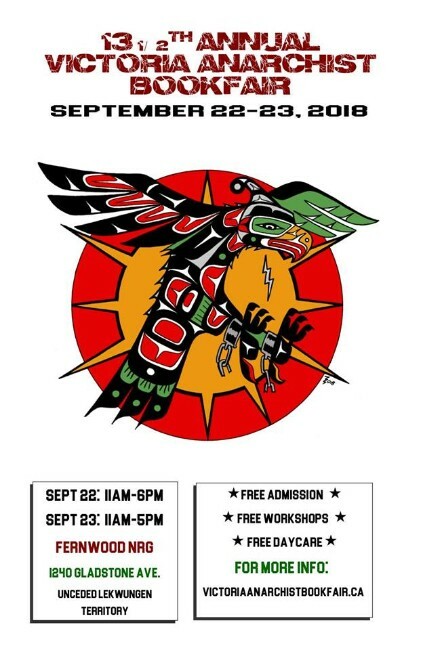 We are pleased to announce the thirteenth annual Victoria Anarchist Bookfair, located on unceded Lekwungen Territory in Victoria, British Columbia. The Bookfair is for anarchists and non-anarchists, with participants from all over North America and beyond. The Bookfair always includes workshops on a wide range of topics. We seek to challenge colonial attitudes, introduce anarchism to the public, foster dialogue between various political traditions, and create radical, inclusive, anti-oppressive spaces. The heart of the Bookfair is the main room including booksellers, distributors, independent presses and activist groups from all over BC, North America, and abroad. If you'd like to table this year, please provide a short description of your group and the materials you intend to distribute at the Bookfair. There is no fee for tabling at the Bookfair, but we suggest 10% of sales after expenses in order to help us cover costs. Registration is open for all events!!! and be sure to register for the Salmon DInner! Camping will be available this year as well with limited space so get yours now!